The Nickel Slots take you on a journey through hard times and desperation that always carries hope that better things are just around the corner. 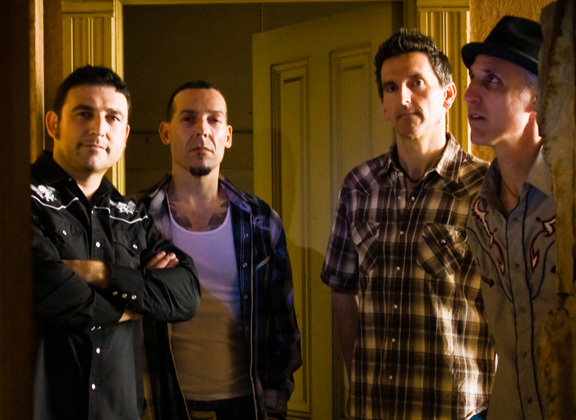 With influence from early roots Americana music as well as a touch of rebellious ’70s punk, The Nickel Slots draw the line that connects Johnny Cash to The Clash. From the sentimental folk tune to the foot-stomping, raucous sing-along, their rocking Americana brings you back to a long-lost memory or shared experience of pain, joy, heartache, love, hope, and redemption. They began performing together in November 2008 in Sacramento, California, and the following spring a song from their debut album spent a month in rotation on KWOD 106.5 FM’s Sounds of Sacramento series. The Nickel Slots have won three Sammie Awards for Outstanding Americana/Alt-Country, one for Best Live Performer, and are now in the Sammies Hall of Fame. Their second album Five Miles Gone prompted SubMerge Magazine to say that it “…will make a serious bid to be the soundtrack of your summer.” The band has toured four times in Europe including headlining a night of The Green Escape music festival in France in 2018, and in March 2015 shared the stage with Bob Seger and the Silver Bullet Band at their concert at Sleep Train Arena. Their debut music video for “The Devil’s Chain Gang” won Best US Music Video at the 2015 American Online Film Awards and two awards at the 2013 Sacramento Film and Music Festival, and all four of The Nickel Slots’ music videos have garnered airplay on multiple TV networks and websites. Americana radio stations both in the USA and Europe are also starting to discover The Nickel Slots’ three albums and Christmas EP. Lead singer, songwriter, and acoustic guitarist Tony Brusca’s songs tell unique stories and he has a knack for connecting with live audiences to make them believe he’s one of them. Bassist and mandolin player Paul Zinn’s backing vocals add an extra dimension to Tony’s melodies, and his bass lines just can’t sit still. Christopher Amaral, The Nickel Slots’ versatile drummer, lays down train beats and adds distinctive power to the band’s sound. His brother, individual Sammie Award winner electric guitarist Steve Amaral, throws down tasteful licks that dance across the line between rock and country. When these boys sink their teeth into a song, they leave a distinctive mark.